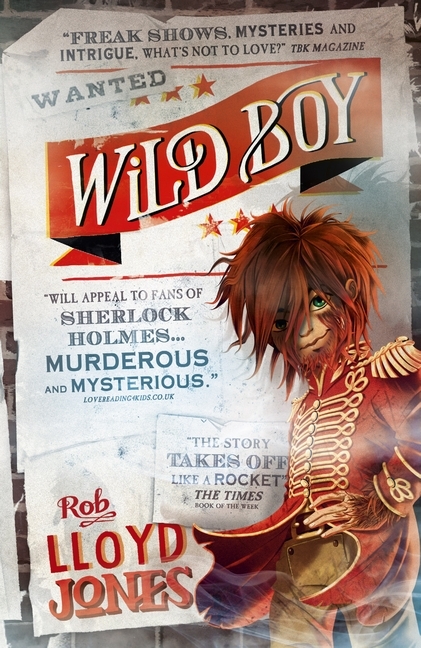 Wild Boy by Rob Lloyd Jones, a gem of the genre or the way young adult fiction is moving? Walking around the school I work at I often see posters for books as part of World Book Day or Bookbuzz. There is always one or two that catch my eye, however these are young adult books and I tend not to pick them up. I have limited time to read and my book pile increases without the frivolity of grabbing a book I have just seen the cover of. A few weeks ago I saw a poster for the latest Bookbuzz offering. One novel caught my eye and intrigued me more than any other I have seen before. It was Wild Boy by Rob Lloyd Jones. Reader comments on the cover such as ‘freaks shows and murder’ and ‘just like Sherlock Holmes’ made me want to grab it. However, I don’t have time for that sort of frivolity so left the thoughts of reading it at the back of my mind. A few days later the school’s Librarian emailed to say that one copy of each Bookbuzz book was in and she wanted a different teacher to read and review each to help get the kids more involved in reading. A comical puff of smoke is all that could be seen of me as I rushed, but did not run, we don’t run in the corridors, to the Library via the quickest route I know. Another teacher had beaten me there but to my joy she had chosen a different book. ‘School boy error,’ I thought as I grasped my copy of Wild Boy. As soon as I got home I opened the book, I do not really know what I was expecting from a young adult book but it wasn’t this. Yes the language was much simpler than I was used to but the story far from it. I knew this book was aimed at Year 7 students but I was a little concerned. Violence and treachery were there from the very first word, surely Year 7s shouldn’t be reading about this. To tell you the truth I was loving it. The book was so easy to read as well, over 30 chapters in the kinds of books I am used to reading would mean a weighty tome but here they were quick punchy numbers. About ten chapters in we had been introduced to a host of characters, a murder and Wild Boy and his new accomplice Clarissa on the run. This was not what I read when I was eleven. All the fantasy books I had available to me were so watered down that they avoided fighting and the peril was so weak I had more of a scare when I burnt toast. I know times have changed and each generation seem to know a bit more than the last but this was worlds apart from my experience. As I continued, the novel had everything I wanted from more adult fiction, a tricky love hate relationship between the two main protagonists, dark intrigued that dispensed with the fluffy loveliness of many books, a secret organisation and a murderous puzzle to solve. There was, however, one issue, I worked it all out right at the beginning, although I enjoyed the book I was just waiting to be proved right. I kept telling myself ‘this is young adult fiction, this is supposed to happen.’ But do you know what? I was wrong. I have read so much adult fiction and got it right, but here I was, at the end of a book for eleven year olds and I had got it all so wrong. The feeling of being surprised turned the book from a great one to a read that was truly brilliant. So much so that there is a second in the series that I am strongly considering buying. The end of the book set this up well, it was clear there were going to be sequels. What was nice here was that it did not feel forced, like a writer trying to make sure they could make a living by churning out book after book with no thought to the content, a simple mass production money-making scheme. This was all so natural, considering the care that had gone into the story there was no way they could just tag on an extension. If the puzzles in the sequel are like the first then Rob Lloyd Jones had some serious planning on his hands. The real big question is, has Wild Boy changed my perceptions of young adult fiction? As you can tell from much of this review I perceived the young adult area of fiction as kind of a poor cousin. Children’s and adult’s literature has some classics but young adult always seemed to be a halfway house to me, never really achieving more than not being mature enough to enjoy whilst losing that childish charm of books for younger audiences. So, whilst I am still not inspired to pick up Harry Potter or Twilight, I now realise that young adult books can push the boundaries and be exciting, we don’t need any of that watered down, half-hearted storytelling. I still have some issues with Wild Boy which I feel would be easy to rectify. Firstly there are too many times when ‘he said’ or ‘she said’ is used, there are other words than said and children need to be exposed to these. To be truthful it got a little annoying at times and I started to change the words myself. Secondly, I am unsure that many eleven year olds would have enough working knowledge of the Victorian era to understand some areas of the book, however this might just be because I did not at eleven. The violence, as well, might be a little too extreme for eleven year olds. An issue, however, I have with other books and TV shows (and may be a major factor of my prejudice towards young adult fiction) that is not present here is the idea that children are the heroes, that your average joe school child could solve such a problem. Rob Lloyd Jones has solved this with Wild Boy, however, by making the teenagers involved so different from your run of the mill nothing special child. Both Wild Boy and Clarissa has such diverse backgrounds that their abilities are truly believable. All in all Wild Boy is an excellent read, it feels less like a young adult novel and moves to what can be defined as simply a novel, it effectively bridges the gap between children’s and adult’s fiction without losing childlike charm or cutting away important story telling. I may delve more into young adult fiction, I really should do as I am trying to write some of it myself, I just sincerely hope that Wild Boy is more than a gem of the genre and shows that young adult fiction is maturing, much like I know its readers are. Thank you, I shall now disappear into the aether once more until I find more time to write.